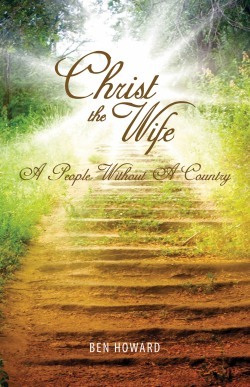 This book titled, Christ the Wife: A People without a Country, which was published in 2014, contains twenty-nine sermons and is dedicated to the wife of the Lamb. In reading this book, please be reminded that this is the Lord Jesus Christ singing to His wife. The Word of God says in Ephesians, Chapter 5, for us to sing unto the Lord. But here in the Book of Zephaniah 3:17 it says the Lord sings unto us - "The Lord thy God in the midst of thee is mighty; he will save, he will rejoice over thee with joy; He will rest in his love, he will joy over thee with singing." I want you to notice, "he will rest in his love, he will joy over thee with singing." And maybe that is a sermon in itself. When a sermon is preached, you are rejoicing! Could it be the Lord is singing to you? When we're happy and we're smiling, sometimes people will ask, "What are you so happy about?" The Lord has been singing to me! So the Lord joys over us with singing. Well, it worked for Him, and He got a wife. But He didn't stop singing to us just because He got us, He continues to sing. He continues to rejoice over us, and He tells us to be exceedingly glad. That's not something He has to tell us to do; for we couldn't stop rejoicing if we tried. One of the privileges that we have is to rejoice and be exceedingly glad! So in Ephesians, Chapter 5, it says to sing unto the Lord. And now we find that He sings back to us. From time to time I'm asked this question, "Brother Ben, what are you talking about when you are using the terminology 'the virgin' and 'the wife' when speaking about the church?" I always answer this question by giving the scriptures found in 2 Corinthians, Chapter 2, and Ephesians, Chapter 5. In 2 Corinthians 11:2:3, Paul tells us about the espoused virgin, saying, "For I am jealous over you with godly jealousy: for I have espoused you to one husband, that I may present you as a chaste virgin to Christ." Notice that Paul was addressing these saints as virgins, because it was the espousal period. But when it came to the wife, Paul prophesied (foresaw) about the marriage in Ephesians 5:30-33, saying, "For we are members of his body, of his flesh, and of his bones. For this cause shall a man leave his father and mother, and shall be joined unto his wife, and they two shall be one flesh. This is a great mystery: but I speak concerning Christ and the church. Nevertheless let every one of you in particular so love his wife even as himself; and the wife see that she reverence her husband." It is only after we are married to Christ, the anointed Word for the hour, that we are baptized into the body of Christ which is His flesh and bones in the earth. Also, in the Book of Revelation 19:7-8 and 21:9, it speaks of the wife; showing that we are a body of believers that have passed the virgin stage and are now fully the wife of the Lord Jesus (the Lamb). In the Book of Galatians 3:23-24, it says, "But before faith came (Paul is explaining law and grace. ), we were kept under the law, shut up unto the faith which should afterwards be revealed (that is the coming of Christ Jesus) . Wherefore the law was our schoolmaster," it gave us a good insight of what God desired. God wanted a holy and righteous people, and the law was to point us in that direction. But it takes the blood of Jesus to cleanse us from sin. The blood had to be shed before the Old Testament saints resurrected unto eternal life. And that is when Christ went down and brought up those Old Testament saints that had kept the law, who kept their conscience alive towards God until Jesus Christ came and died for them. The law was given as a schoolmaster. " Wherefore the law was our schoolmaster to bring us unto Christ, that we might be justified by faith." And now we are justified by faith. Then if we add any works to make our justification better, then we are frustrating the grace of God. So we don't frustrate the grace of God, because if we are justified by the law then Christ died in vain. Verse 25, "But after that faith is come, we are no longer under a schoolmaster." Now is that clear-cut or what? He said the law was a schoolmaster until Christ came. The Word says that when faith comes we are no longer under a schoolmaster. I want it to be quite clear to us that it is Christ living His life through us, because it is only by faith in Christ that we are justified. Verse 26 says, "For ye are all the children of God by faith in Christ Jesus." Paul is talking to the Galatians here. He had so much trouble trying to get these Galatians to keep their heads on straight when it came to law and grace. So he is saying, "You are children of God by faith in Christ Jesus; not any of these other things." Then he goes on to say, Verse 27, "For as many of you as have been baptized into Christ have put on Christ." Please notice carefully what this is saying, "For as many of you as have been baptized into Christ…" See, baptized into Christ is passing the till of Ephesians 4:13 where we reach the fullness of the man Christ Jesus in marriage. It says here, Verse 28, "There is neither Jew nor Greek," and when we are baptized into the body of Christ all those barriers fade away. Paul's revelation is so beautiful here; for when he went forth to preach, the Gentiles were basically without God, strangers to the covenant of God as Ephesians, Chapter 2, says. So God sent Paul to them. But when Paul went to the Gentiles he didn't draw a line and say, "You Jews can't have this." Remember, Apollos was a Jew, one of John's disciples. He was mighty in the scriptures, an eloquent man. But the Bible says he only knew John's baptism (he was only baptized unto John's message); he didn't know Christ had come. He was preaching, "We've had John (the forerunner) come; now we're expecting Christ any time." Well, there was a nice Jewish couple. The wife's name was Priscilla and her husband was Aquila. (Acts, Chapter 18) They went to Apollos' meeting and they were so amazed, "My, what an eloquent man this is and it is amazing how mighty he is in the scriptures." But his understanding stopped short of the fact that Jesus Christ had already come. Keep in mind that the New Testament had not been written at this time which would have given him the knowledge that the Messiah had already come. So after the service, Aquila and Pricilla waited around for a chance to talk to Apollos. They might have said, "Apollos, will you come over and have some tea with us? We'd like to fellowship with you." They got a chance to talk with Apollos. And the Bible says, "They expounded the way of the Lord more perfectly to him." It wasn't, what Apollos preached needed to be thrown in the garbage can. No, it was that he just needed something to be added to what he already had. This reminds me of the message I preached when we were in Nasanje, Malawi, entitled, Lord Give Us a Heart Likened unto Apollos. This message was showing that Apollos just needed a furtherance of the Word, and he had a heart that could receive it. Even when Paul was preaching a message in Acts, Chapter 13, he brought in the scripture where John fit in God's plan, so that they could have in their mind a straight line of revelation with no gaps in it. So Apollos, no doubt, was shocked at what he heard, "Do you mean Christ has already come?" So Aquila and Pricilla realized their limitations and waited until they got in touch with Paul before they took him any deeper into the Word, so that Paul could preach to him. Paul mentioned Apollos in 1 Corinthians 3:4-6, saying, "For while one saith, I am of Paul; and another, I am of Apollos; are ye not carnal? Who then is Paul, and who is Apollos, but ministers by whom ye believed, even as the Lord gave to every man? I have planted. Apollos watered; but God gave the increase." Apollos became a mighty minister after hearing Paul's message; and he was a Jew. Then by his ministry, many of those Jews had their hearts opened to the Word. There were many of the Jews that heard Paul's gospel and they came in and accepted it and became a part of the virgin church. And in this body of believers there were neither Jew nor Gentile that were separated one from the other. See, that is what Paul was telling these Galatians. We can't say, "I am a Jew; I've got rights to this." And we can't say, "I am a Gentile; I've got special rights." No, when we are baptized into the body of Christ we're part of Christ. We are only a member of the body of Christ. We are Christ the wife: a people without a country. I am talking about claiming the blessings of God as part of the wife. I want go to the Book of Ephesians 2:14, just to further establish that we're not Jews and we're not Gentiles. We are Christians. There is a lot to read, so I'm going to skip down to Verse 14. It says, "For he is our peace, who hath made both one, (Now is the wife Jew or Gentile? Neither. We are the wife of the Lamb. When we are baptized into the body of Christ we lose our nationality. We want to keep the laws of the country we live in as much as possible, but I am talking spiritually here. Because we are the wife of the Lamb, our nationality fades into obscurity. Now watch.) and hath broken down the middle wall of partition between us:" In the early church there were three groups of Christians; there were the Christian Messianic Jews (which included Peter, James, and John) who kept part of the law even after becoming Christians. When we read the Book of James, we can see that he was a champion of the law. Then there was the Gentile group that accepted Christ but could not settle on what to do about the law and grace issue. So they were Gentiles that were unsure of what Paul was saying about the body of Christ, which was the only message of that day that would espouse the virgin to Christ. Some of them even challenged Paul's authority to be the only apostle to bring a message to Christ's virgin. Paul had to tell them that he was not a whit behind any of the other apostles. They basically went their own way, much like it is today. But there was a third group that began to hear what Paul said and they accepted it. These were Jews and Gentiles that accepted Paul's message and became the body of Christ for that day under the baptism of the Holy Ghost. And it was not until Paul was in prison that he got the full revelation of the body of Christ, and he laid it in the Word for us just before God took him home. And now through this prophetic message of the last trump, God has broken down the middle wall of partition and has made this third group of both people the wife for His Son; and I'm to preach to them. And this is what we are dealing with now, speaking of the wife part of the redeemed family of God. So regardless of whether we are a Jew, Greek, bond, free, male, or female - when we are baptized into the body of Christ we are part of Christ the Wife: A People without a Country - a new man. This new man is neither Jew nor Gentile; for God created a new man, the third man, the body of Christ - which consists of all of us. We collectively become the new man by being baptized into the Mighty Angel. Now in this earthly realm there are still the Jews and there are still the Gentiles as separate nations. But in the spiritual realm there is only one new man; he is a spiritual man created by being baptized into the body of Christ.